Bedford Summer Outing 2012 - Royal Observer Corps Association This website was set up in October 2012 and is the new official site for the Royal Observer Corps Association. Our group’s most ambitious outing to date was very dependent on good weather but God smiled and gave us one of the most glorious sunny days of the summer. This year’s outing consisted of a combined visit to Savill Gardens in Windsor, followed by a river boat cruise along the Thames. The Royal Gardens, situated within Windsor Great Park, consists of Savill & Valley Gardens, and is administered by the Royal Landscape Division of the Royal Estates at Windsor. Our purpose was to visit the smaller of the two - Savill Gardens - which was named after Sir Eric Savill deputy surveyor at Windsor. He secured approval from King George V & Queen Mary in 1934 to produce a garden within the Great Park . The later Valley Garden regarded as the younger sibling of the Savill Garden wasn’t created until 1946 this is much larger & borders on a magnificent lake called Virginia Water well worth a visit in you are in the Windsor district. Our party consisted of 37 members, families and friends, a really excellent turnout as this outing was very weather dependant. Especially after our experience of the afternoon rain at last year’s outing at Highclere Castle! We all agreed that that the gardens, on that splendid Sunday morning, were superb, and the sunshine on the flowers made the colours stand out in their beauty. The various sculptures, intermingled within the garden, were a delightful curiosity to behold. Lunch in the main restaurant was excellent, with an option of a Sunday roast and other dishes. The meal was rounded off with a nice cup of coffee or tea. We dined extensively but I did miss my pudding which, unfortunately, was not on the menu! 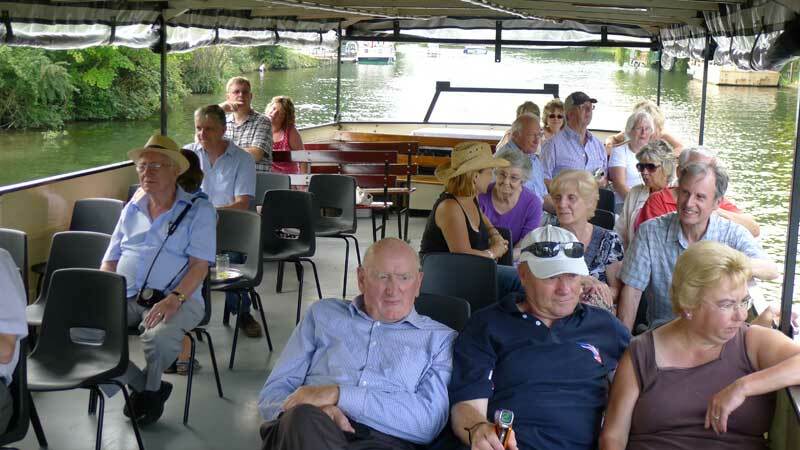 The 2 hour cruise was a return trip from Runnymede to Romney Lock, situated just east of the Windsor and Eton road bridge. Everyone enjoyed their trip on the boat, which was aptly named Bray Royalle. It was exclusively ours with no other parties on board. We made use of the fully equipped bar, and enjoyed a traditional English cream tea with strawberries and scones! What could be better than that, on a hot sunny Sunday afternoon? This was true paradise for me with my ROCA colleagues, who told me that it was the best summer outing to date . This year’s outing was the best to date not only because of the wonderful weather and superb venues – not forgetting our excellent lunch and our cream tea - but mainly because of the support of all who attended on the day.